REACH I programming completed its three-year program cycle in June 2015. The project underwent an external evaluation and the results were quite positive - with significant improvements in retention and educational quality, especially life skills education​​ and teacher capacity building. 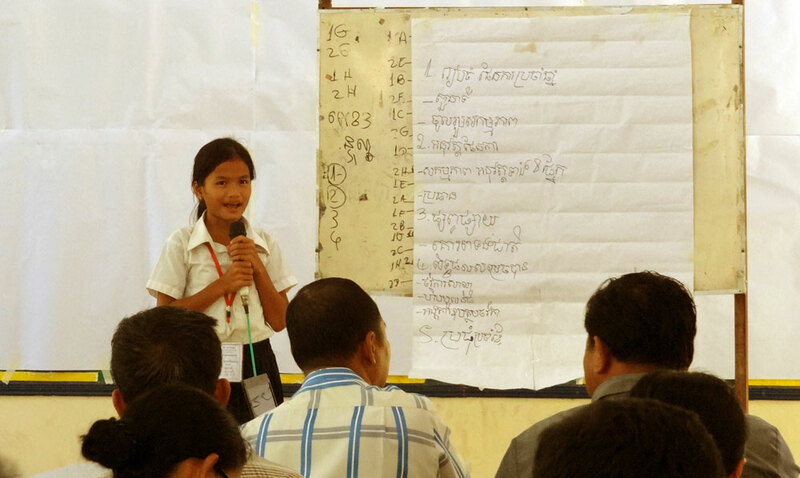 At the invitation of WeWorld, KAPE prepared a proposal for REACH II for a three year extension (2015 – 2018) to consolidate gains in schools in Svay Rieng and Prey Veng and expand the integrated programming model developed to two new provinces -- Kampong Chhnang and Pursat. The current phase of project programming will include a policy component that will help the Ministry introduce electronic EGRA testing which will increase validity and reliability of data dealing with student learning outcomes. REACH II’s objective is to enhance numeracy, literacy, and life skills knowledge through integrated strategies that promote improved learning environments, both in the school and at home within the four target provinces. REACH II will retain an integrated approach taking in multi-dimensional programming in access; educational quality; health & safety; community engagement, and good governance. There will be a greater focus on early grade reading and numeracy using recent KAPE innovations in the development of literacy toolkits, M-learning, and assessment-driven learning outside of the classroom. The project will continue to introduce technology for literacy to selected schools with high governance levels. The project will also include rigorous testing, e.g., EGRA, to generate empirical evidence of impact as well cost-benefit analyses. Children from preschools to grade 6 in 50 primary schools in 10 districts in four provinces: Svay Rieng, Prey Veng, Kampong Chhnang and Pursat. Support pre-primary school in four target provinces including teaching and learning material, classroom renovation, exposure visit and teaching methodology. Provide training to school management team and measures of Good Governance that include multiple aspects including transparency, financial management, accountability, and data management improve at all levels (school level, cluster level and districts levels. Provide technology devices to target schools and Districts of Education to manage data, information and use to evaluate student learning.